Today I want to introduce you to my latest project. 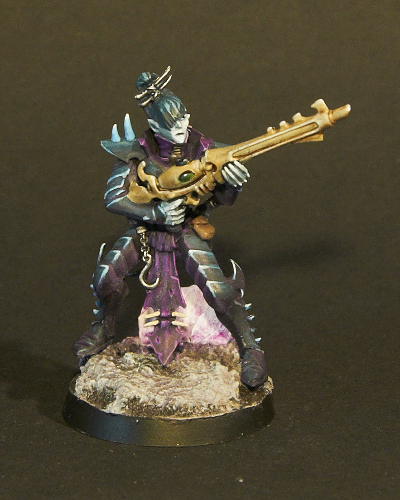 It's a Warhammer 40k Dark Eldar Army called "The Ruthless Ice Blades". So you might ask why Dark Eldar and why this name. I selected Dark Eldar for a number of reasons. First, I want to have an army with as much female miniatures as possible. In Warhammer and especially in Warhammer 40k that is not very easy. Second I want miniatures which are more human and not robots, supermen in cans or insects. So the range became even smaller. 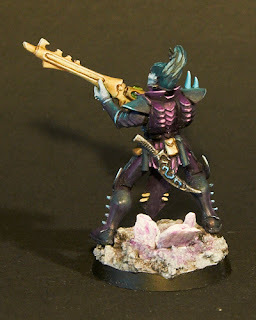 And last but not least I love the miniature of one of the leaders, Lelith Hesperax. So guess who will be the leader of "The Ruthless Ice Blades". The name has also various reasons. Before I started this project I read the codex and especially the background story. All the time I had the picutes of a dark, cold city made of black and glassy stuff going around in my head. For me Dark Eldar are as cold and dark as their city. I also figure that there is always an icy wind howling in the streets. These ideas led to the name and also to my color scheme. Thanks for the background information. I have participated in your painting session with this mini. And I really like the used colour scheme. It looks very good and I am looking forward to seeing the entire army in that look and feel. I take that as a challenge :) Looking forward to our next battle! Both wont stop the WAAAAAAAAAAAAAAAAAAAAGGGGGGGHHHHHHHHHHHHHHHHHHHH!